Anyone who’s watched the news recently might be forgiven for asking, when will it all end? Never-ending ineptitude makes for painful viewing. Social gives many marketers the same feeling. Like bad news stories, social never ends, meaning it’s a painful process if you’re doing it all wrong. The cost of content production is the single biggest barrier to success. Then factor in ‘paid’ budget to get content seen, and social becomes a costly business. Staleness is another factor. The same creative teams delivering content week-on-week eventually leads to ennui. 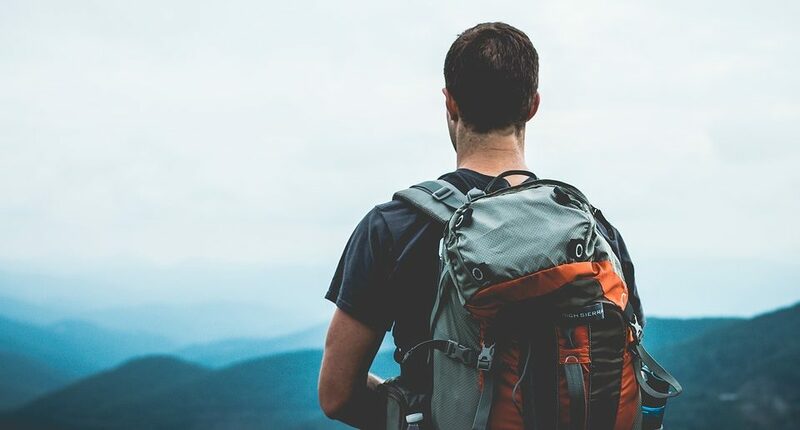 Micro influencers, and even regular consumer content, can be a great tonic for these challenges, and ensuring clients don’t need to ‘vote leave’ from their agencies. Instagram is packed with exceptional creators known as ‘micro influencers’, many of whom can capture content brands usually pay a fortune for, at a fraction of the cost, or even free. Their content can be naturally authentic, meaning it’s native to the channels, and comes from an almost unlimited talent pool, so creativity need never become stale. Brands working with micro influencers and consumer creators for content production is not news, but a quick perusal of Instagram clearly shows how widespread the trend has become of late. Here are a few examples that caught our attention. EasyJet outsources virtually all of its posts to the same everyday folks who use the airline. 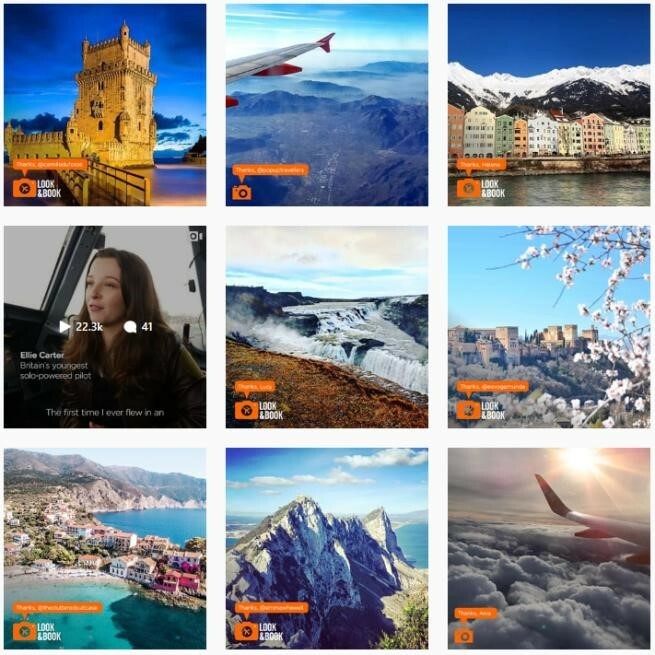 Easyjet’s social team finds the most engaging content taken in locations it wishes to promote, gaining permission from the creator before posting. It appears that no fees are paid. The content serves a duel purpose of encouraging followers to download EasyJet’s app – where consumers can “Look & Book”. The tactic means content is kept fresh and authentic, while also sending consumers down the digital sales funnel. A clever and cost-effective way to ensure EasyJet keeps flying high. 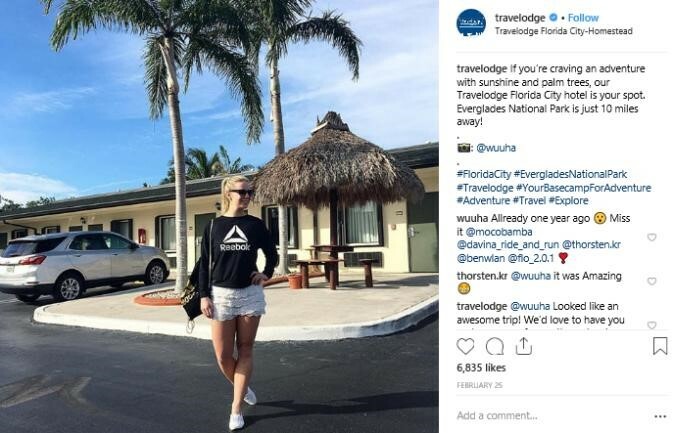 Travelodge has around a 50/50 split with content from micro-influencers and self-produced content. Like EasyJet, Travelodge publishes beautiful content taken in Travelodge- locations. The hotel chain also works with micro-influencers to create content onsite at the hotels, adding a sprinkling of glamour to otherwise familiar budget hotel settings. Boasting around 67k Instagram followers, Where’s Mollie is in the upper echelons of the ‘micro influencer’. She may require a higher fee than the above examples, but it’s also true that sub 100k influencers tend to achieve stronger engagement ratios than bigger players with six figure followings. This means influencers of Mollie’s size can deliver great value if deployed effectively. Visit England sponsored the US blogger’s recent trip to the UK, creating a series of eight stills and videos. It’s difficult to truly quantify success without knowing the fees involved, but the content certainly looked fantastic and generated plenty of views and chatter. The partnership showed the power of opportunism, with Visit England scoring a hit by engaging a relevant influencer at the right time, to piggyback her UK trip. If you’re asking “when will it all end?” with your social, it needn’t be that way. Give Debbie at Clarion a call on 0207 343 3110 or email djackson@clarioncomms.co.uk for more info.